As magical as Thermage is, it is still important to be informed and prepared to get the most out of your treatment. Below you will find a guide as well as before and after care recommendations. We have performed many Thermage procedures and have seen it all. Trust our Thermage experts for the most successful and beautiful results. Before your treatment, get acquainted with what to expect. Understand the process. Thermage treatments use a device that tightens skin on your face and body without making any incisions or using lasers. Rather, the device emits pulses that heat the skin, causing it to contract. Contact Beautique Medical Spa to learn if Thermage is right for your needs. Dr. Sanchez or any of our experts can explain all aspects of the procedure and will also be able to do an evaluation to determine if treatment is right for you. Schedule enough time for your treatment. The length of the Thermage treatment will vary depending on the treated area. This means that, for some patients, a Thermage treatment only lasts a few minutes, while others may spend up to an hour with the doctor. Most importantly, remember that your results will appear and improve gradually. Although a lot of people notice improvement immediately after a Thermage treatment, the skin’s appearance continues to improve in the weeks and months that follow. Following the procedure there is little to no down time. You can ensure the most out of your treatment by taking good care of your skin. Preventing future damage is very important as this will ensure prolonging the reversal of prior damage. Wash that face! No matter what type of treatments you have, it is always important to keep your face clean meaning pores free of dirt and makeup. Use a high quality face wash with gentle circular motions to improve blood circulation. Use an antioxidant rich cream like Mask Biotense by Nelly DeVuyst. Antioxidants prevent collagen from breaking down. Use a good daily sunscreen like SPF 30 Broad Spectrum Sunscreen by Nelly DeVuyst. We love the sun too, but the sun’s harmful rays wreak havoc on our skin and promote premature aging. Protect your skin! Invest in a heavy duty nighttime moisturizer and make sure it contains wrinkle-fighting ingredients – we recommend Lifecell Plus Mask by (you guessed it) Nelly DeVuyst. Exfoliate! Regularly exfoliating promotes cell turnover which generates new cells and brightens skin. Thermage also works well with other amazing treatments like Kybella, Botox and Dermal Fillers. Read about Thermage and Kybella in a blog from our archive here The Dynamic Duo – Kybella + Thermage. 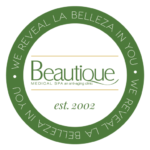 Whatever your desired results are, Beautique Medical Spa can get you there. Dr. Sanchez can create a tailored treatment plan to successfully meet your beauty needs! Learn something new? Share it with your friends by clicking the share link below!